Chiefs Fortune is an online video slot machine game released in November 1999 and it is offered exclusively at online casinos powered by Microgaming. This online video slot game has 3 reels and 1 pay line. The theme of Chiefs Fortune is inspired by the traditional rituals performed by Native American Indians such as the rain dance. In the later days of August when the land is very dry, Native American tribes in the Southwestern United States perform a rain dance. Up to this day, this ritual is still performed by men and women who wore special clothing and headdresses. Goat hair was put in the headdresses and any object having a blue color (signifies the wind and rain) such as turquoise is put in their clothes. Every year, these special clothes were worn for the rain dance. You will get to meet the Indian Chief who will invite you to join their rain dance. Experience wearing traditional Indian headdress and clothes, and you even learn how to shoot an Indian arrow onto a wooden target block in the Chiefs Fortune online slot game! Microgaming online slot games are available to players in 2 formats – download and no-download. Whether you like to download their software first or you prefer to play instantly without the need to download, then Microgaming surely has online slot machine games to accommodate your every slot gaming preference. Good thing that Chiefs Fortune is available for instant play, so you do not have to download anything to find out if this game interests you in a way that you would like to spend some real money on it. Chiefs Fortune is created for players who are fascinated with the rich culture and traditions of the Native American Indians as well as the desire to play and win a nice amount of cash while playing a simple online slots game with a few non-complex features. The Chiefs Fortune online video slot game features a Wild symbol, a Chiefs Fortune Bonus Feature game where you can win up to 600 credits, a maximum coin jackpot of 2,000, and a maximum cash jackpot of $2,000! The quality of the graphics and sound that Microgaming provides is absolutely fantastic and top notch. They have an impeccable reputation of making the most stunning graphics and true-to-life sound effects that will truly transport you to “that specific theme” they used in any of their slot games. Most people love to play games incorporated with Microgaming software because they have smooth animation and engaging yet non-interfering sounds. Since it is essentially a no-frills type of slot game, Chiefs Fortune has been designed to have a simple classic slot game with matching sound effects. The casing of the reels includes the reels, buttons and the paytable. The overall graphic design of Chiefs Fortune shows a tribe of Native American Indians gathered up to give thanks to Mother Nature for the wonderful things they have been given for the season, and to simply ask Mother Nature to give them rain in order to help them with the drought season (by performing a rain dance). Various colors used in the slot game include blue, green, purple, red, orange, yellow, black and white. The constant background music you will hear in this game resembles the music from customary Native American Indians’ celebratory dances, accompanied by hooting sounds and merry cries of its dancers. Whenever you spin the reels and get winning combinations, simple sounds common in land-based slot machine games will be heard. When you get the Arrow symbol, you will hear the sound effect of an arrow shot in the air and twanged when it landed on the wooden target. There are no card deck symbols available in the Chiefs Fortune online video slot game. The regular symbols that you will find in Chiefs Fortune are the 3-Bar, 3-Bar, 1-Bar, Red Seven, and the Chiefs Fortune Logo. The Wild Symbol is the Chief himself. It acts as a substitute for all other symbols (except for the scatter symbol) in order to help you complete a winning combination. The Scatter Symbol is the Magic Arrow. The Magic Arrow scatter symbol only comes out on the 3rd reel. The Magic Arrow symbol can be found just below the reels, at a wooden target tree trunk. If you wager the max bet of 3 coins and you managed to collect 5 Magic Arrows, you will activate the Chief Fortune Bonus Feature game. Please take note that the Magic Arrow scatter symbol will not give out any winnings; however, it lets you enter and play the Chiefs Fortune Bonus Feature game. 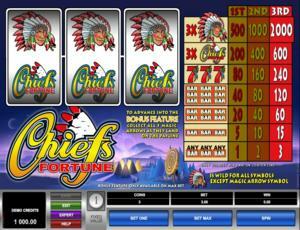 Chiefs Fortune Bonus Feature Game – The Magic Arrow scatter symbol is only available on the 3rd reel. If you bet 1 or 2 coins only and the Magic Arrow scatter symbol appears on the pay line, you are not rewarded a Magic Arrow which is required to unlock the Chiefs Fortune Bonus Feature game. If you bet 3 coins and the Magic Arrow scatter symbol appears on the pay line, 1 Magic Arrow is shot into the wooden target board. When you have collected 5 Magic Arrow symbols, the Chiefs Fortune Bonus Feature game is activated. When you get a Magic Arrow, it is kept until you have collected 5 Magic Arrows that is required to enter and play the Chiefs Fortune Bonus Feature game. Even if you exit the Chiefs Fortune online slot game, you will not lose the Magic Arrows you have collected before. The objective of the Chiefs Fortune Bonus Feature game is to simply click the “Spin button” to help the Chief dress up in preparation for the big rain dance. Random clothes (for different parts of the body) that are worth different bonus prizes will be shown. The sum of your bonus prizes will be placed in the bonus win box. You can win up to 600 credits in the Chiefs Fortune Bonus Feature game. Once the Chiefs Fortune Bonus Feature game is over, you will be then taken back to the main Chiefs Fortune online slot game, and your winnings from the bonus game will be included to your overall balance. Chiefs Fortune has 3 reels where you may bet on 1 pay line only. The available coin size is only 1 credit coin. You can wager from 1 up to 3 coins per pay line. Thus, the minimum amount you can bet is 1.00 and the maximum amount you can bet is 3.00 per spin. Please take note that the amounts mentioned above are in Pounds, but they will remain the same if you choose to play in US dollars, Euros, or Canadian dollars. Also, for every coin that you wager, you will activate a higher pay line. You must wager a maximum of 3 coins for the Chiefs Fortune Bonus Feature game to be enabled. The maximum payout in the regular Chiefs Fortune online slot game is 2,000 coins. Online video slots are much easier and more fun to play when it has an Autoplay function. In Microgaming online slot games, they have 2 game modes – Regular mode and Expert mode. If you would like to play the Chiefs Fortune online video slot game automatically, all you need to do is access the Autoplay function by clicking on the “Expert” button located at the left corner of the game screen. In it, you will find the Autoplay setting that lets you play a desired number of consecutive spins automatically.